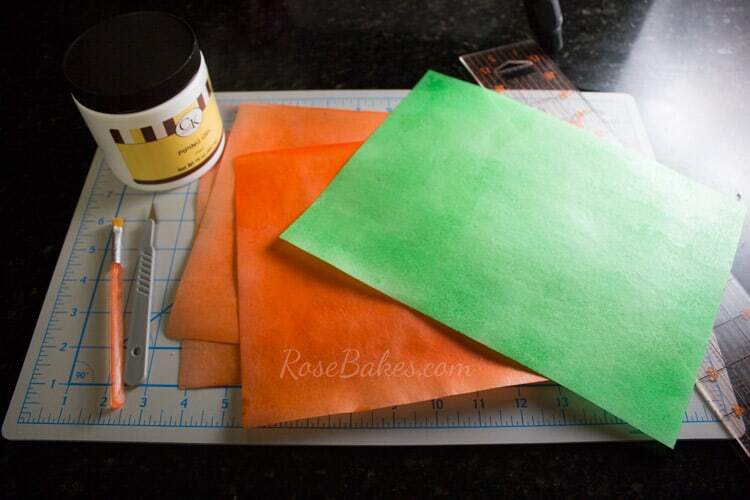 I know ya’ll have probably seen these paper pumpkin crafts floating around for, well… forever, but my friend (and assistant) Susan had the brilliant idea to do the same craft with wafer paper to make cake toppers… and so was born these Wafer Paper Pumpkin Cake Toppers! I fell totally and completely in love with wafer paper after doing that first wafer paper ruffles cake a few months ago. Unfortunately, I haven’t had a lot of time to work or play with it since then, other than a couple of flowers here and there. So when Susan had this idea, I got SO excited! 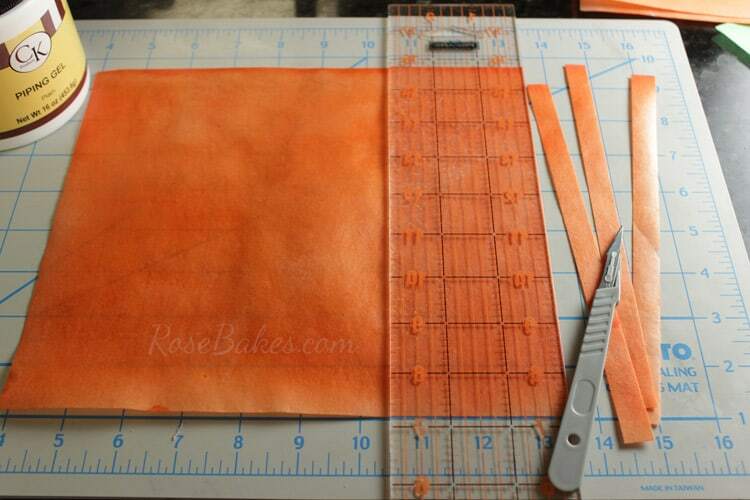 A work mat – I love, love, LOVE this one! *I used my airbrush to color the orange wafer paper (actually, my hubby did it for me), but I forgot to ask him to do brown or green and he had already cleaned the airbrush, so I used Wilton Color Mist to do the green sheet. Both work equally well in my opinion, so if you don’t have an airbrush, grab some Wilton spray! Spray lightly one side, let it dry, flip it over and spray the other side. If the color is not bright enough for you, repeat! Be careful to do light layers of color – if you saturate the paper, it will begin to disintegrate. When you have everything together, it’s time to get started! 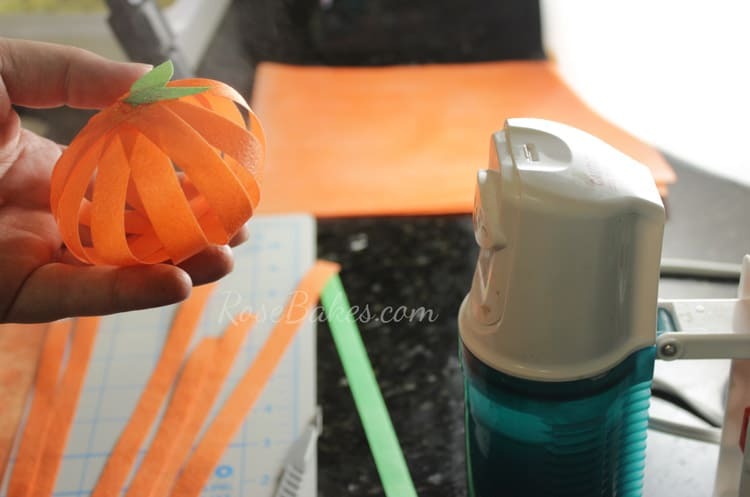 These adorable little pumpkins only take a few minutes to make and they’re ready to use immediately! Isn’t that fantastic? No drying time or waiting… start to finish you can have them done in probably 20 minutes or less! 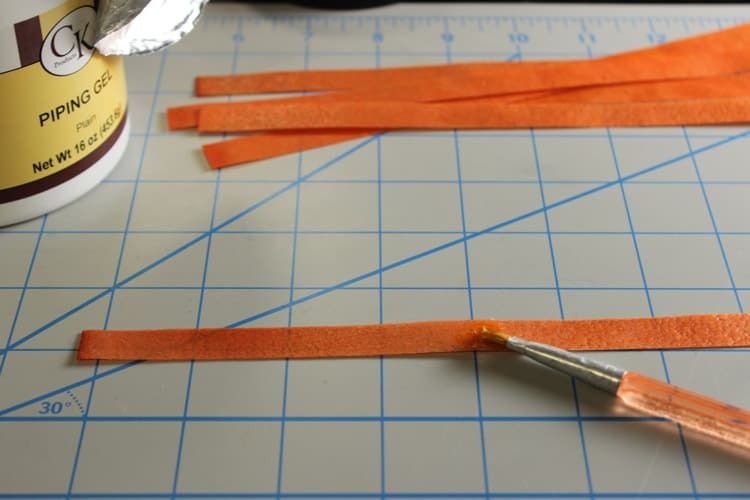 Step 1: Lay out the orange wafer paper and cut into 1/2 inch strips using your ruler and scalpel. If you’re working on a lined mat like mine, it’s SUPER easy! 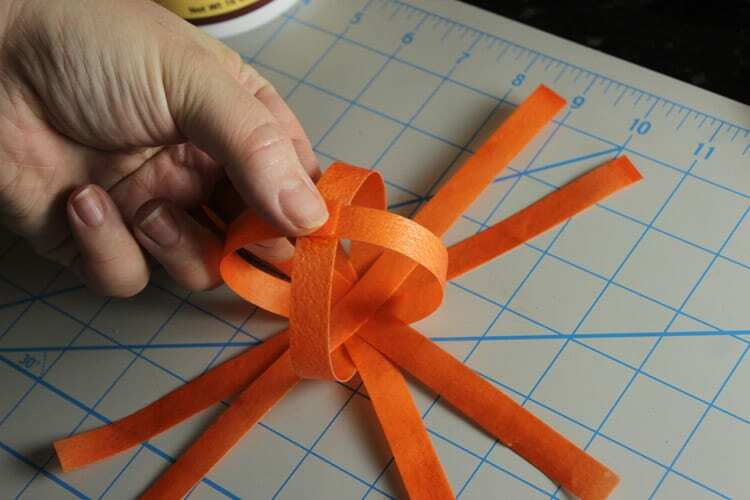 You’ll need 6 strips for each small pumpkin. 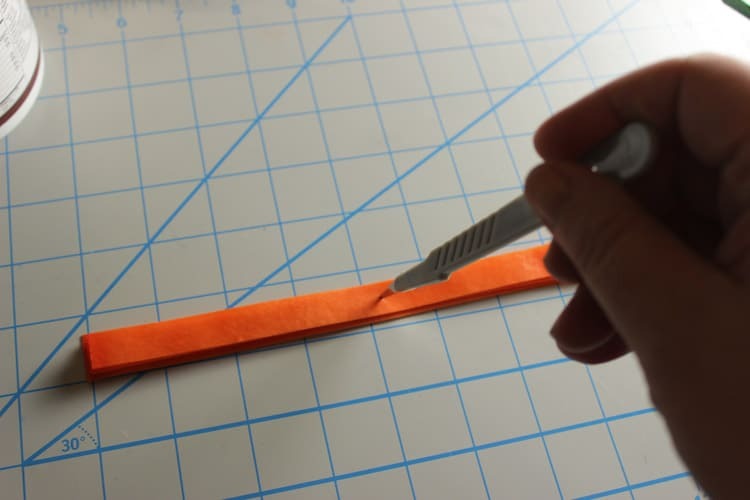 If you wanted to do a larger pumpkin, you could cut your strips length-wise! 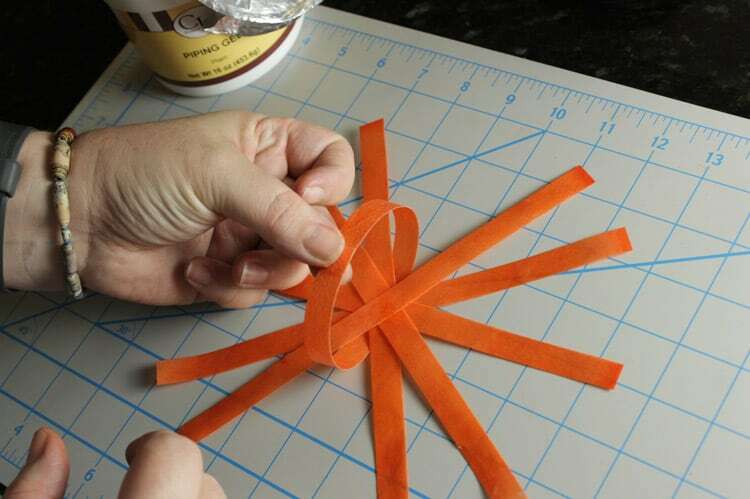 I chose to do them cut them on the shorter side of the paper and I got enough strips for 3 small pumpkins. Step 2: Stack them all up and mark the middle. I used my scalpel to poke a tiny hole. 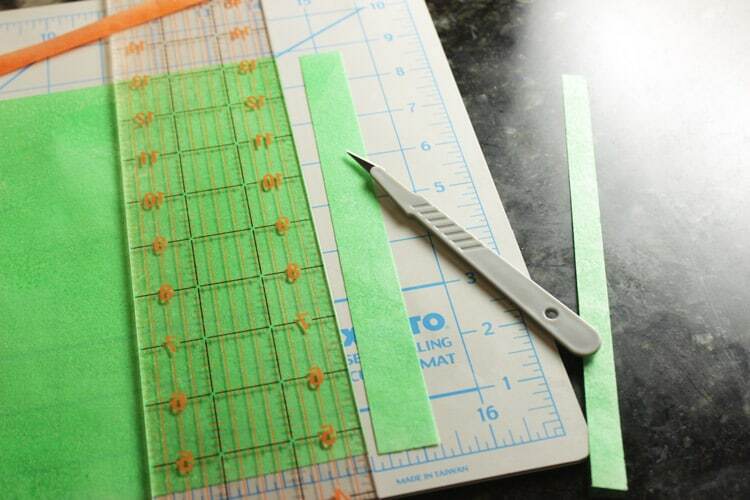 Step 3: Lay out the strips with rougher (textured) side up. 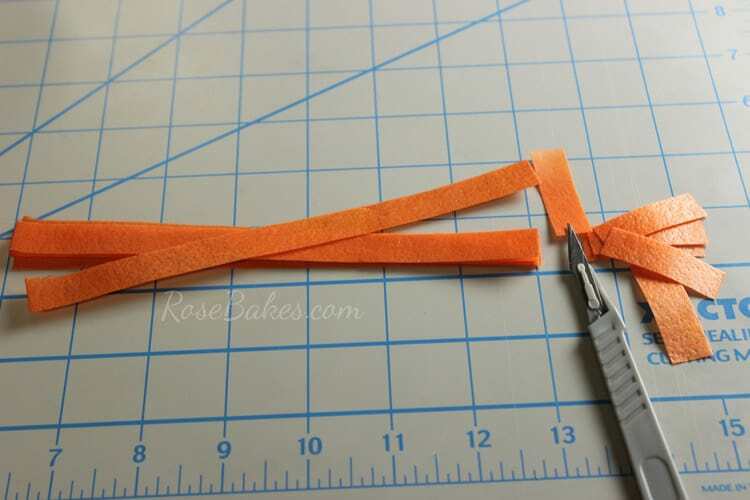 Using piping gel or sugar glue (I opted for piping gel this time), put a tiny brushing of piping gel in the very center of the strip. 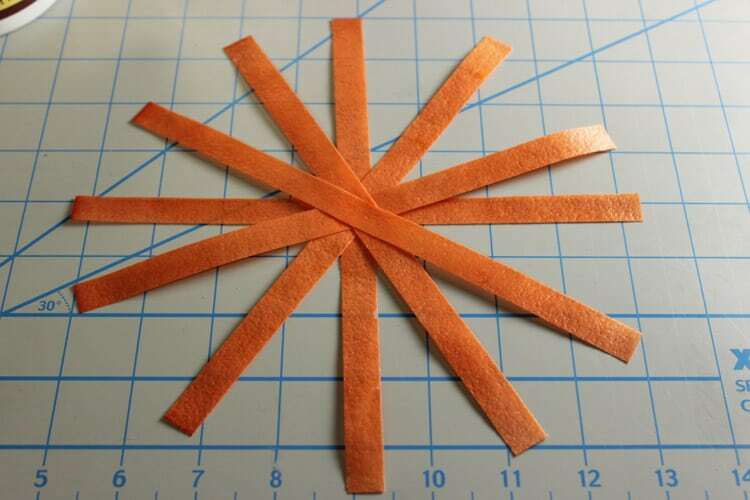 Step 4: Layer the strips, one on top of each other, with a tiny dot of piping gel between each one, in a star pattern. Make sure to keep them centered or you’ll have a really wonky pumpkin! 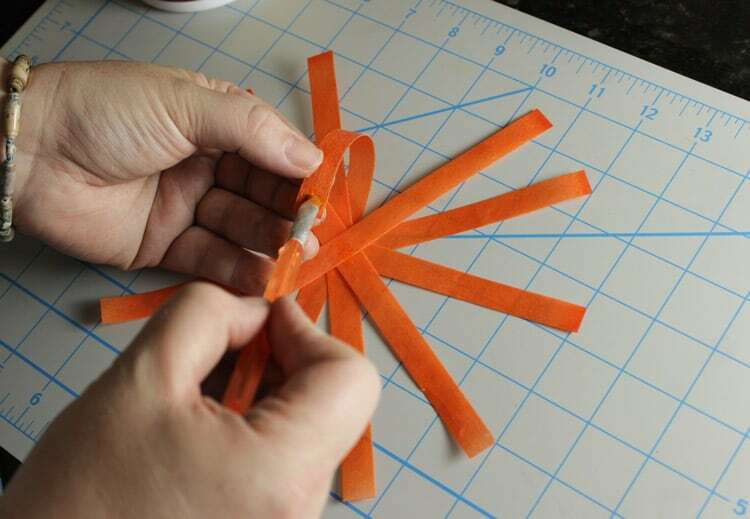 Step 5: Flip the star over, then start folding them up and over to form a circle – attaching the ends together with a dot of piping gel. I started with the strip on the bottom (once flipped). You can see below that all of the other strips are on top of the one I started with. 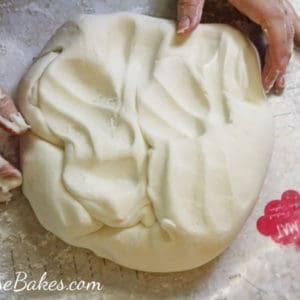 Pinch them together for just a few seconds until it’s secured and will hold on it’s own. Step 9: Now to add leaves and a stem. 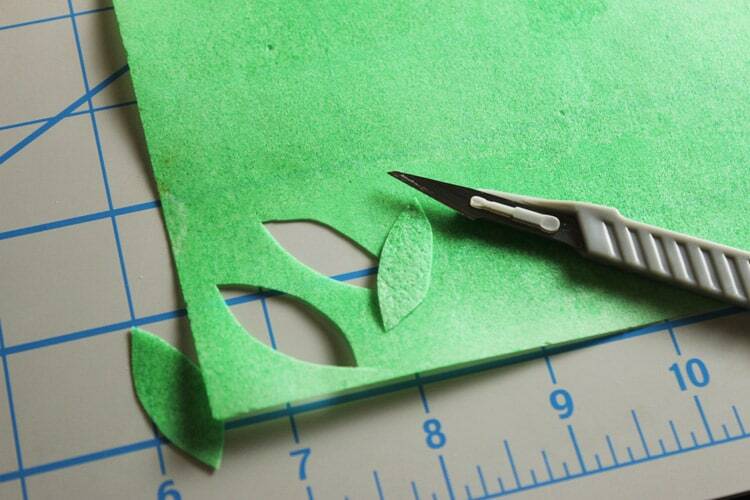 I hand-cut the leaves with a scalpel… easy-peasy. 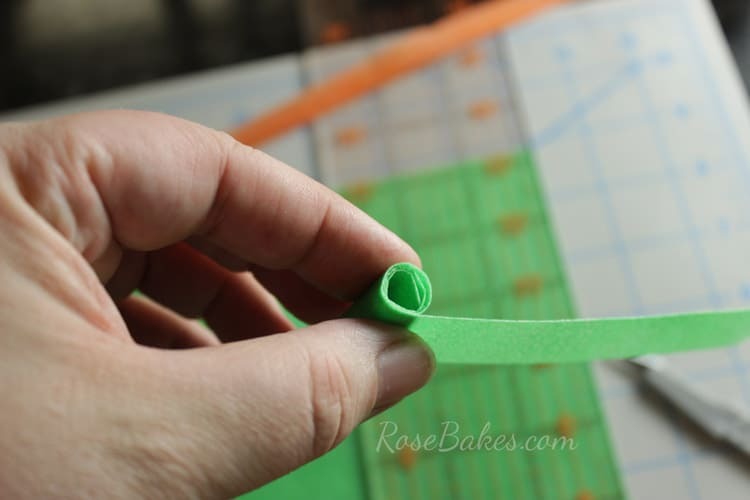 Step 10: For the stem, I cut a strip of green wafer paper, then rolled it up as tight as I could get it. 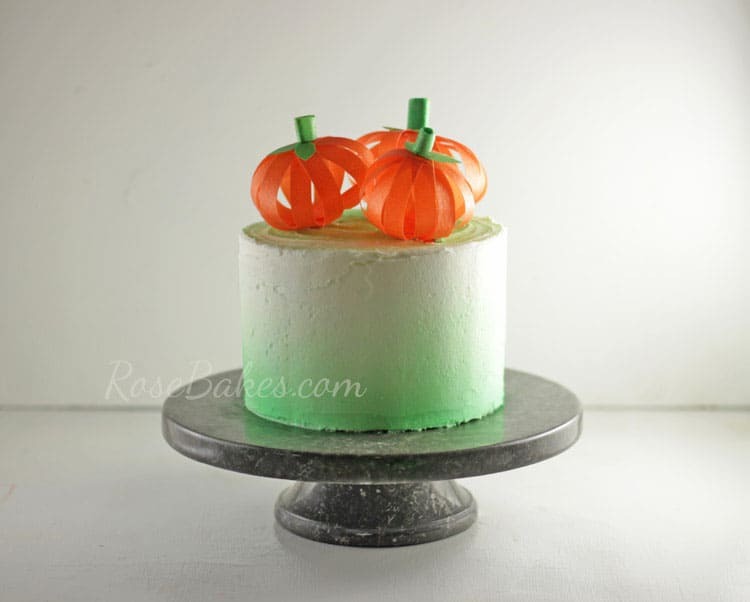 I held it in front of the steamer for a second to get the end sealed but you could also use a dot of piping gel. 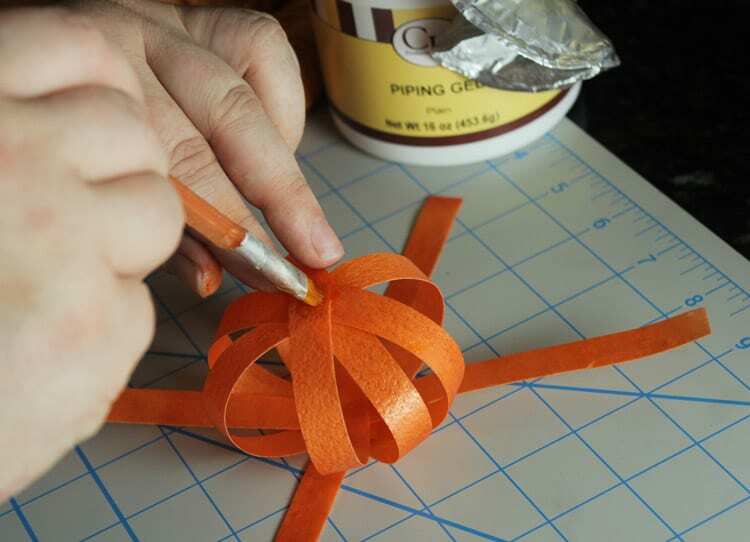 Step 11: Use a dot of piping gel to attach the stem to the top of the pumpkin. Because of it’s weight, I had to hold this on a little longer for it to be stuck. Step 12: You’re DONE!! 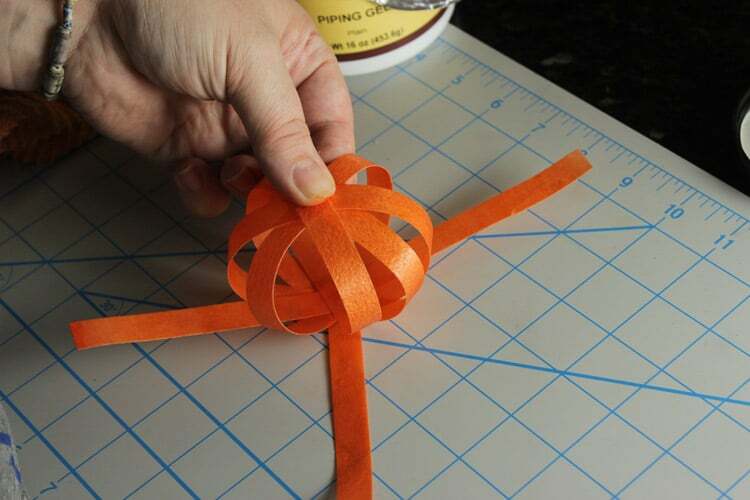 I made 3 of these in about 30 minutes total, then placed them on a small 6″ round cake for completely edible wafer paper toppers! 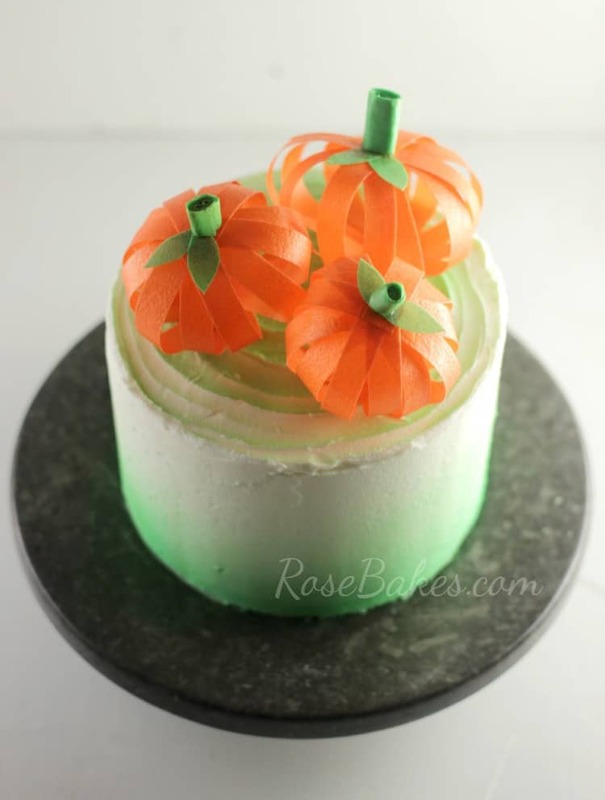 I placed the pumpkins directly onto buttercream and had no trouble with it! Two days later and they were still intact and beautiful!! 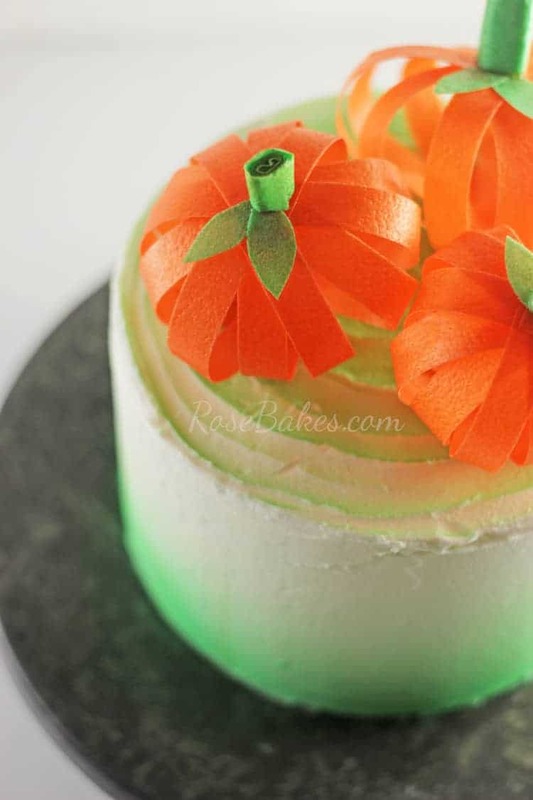 (It was a dummy cake ya’ll… I don’t normally just leave cakes sitting around for days 😉 ) You could use them for a fall birthday cake, a Thanksgiving get-together, a visit to the pumpkin patch… the possibilities are endless! 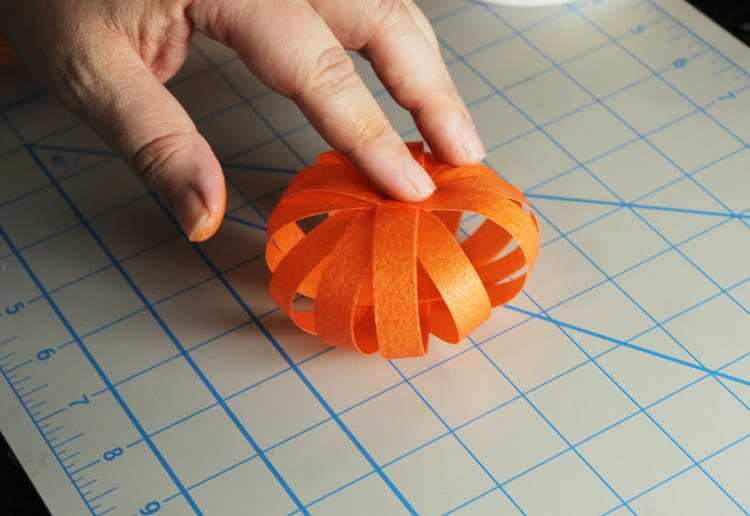 Do you have any questions about making these Wafer Paper Pumpkin Cake Toppers? Leave me a comment! 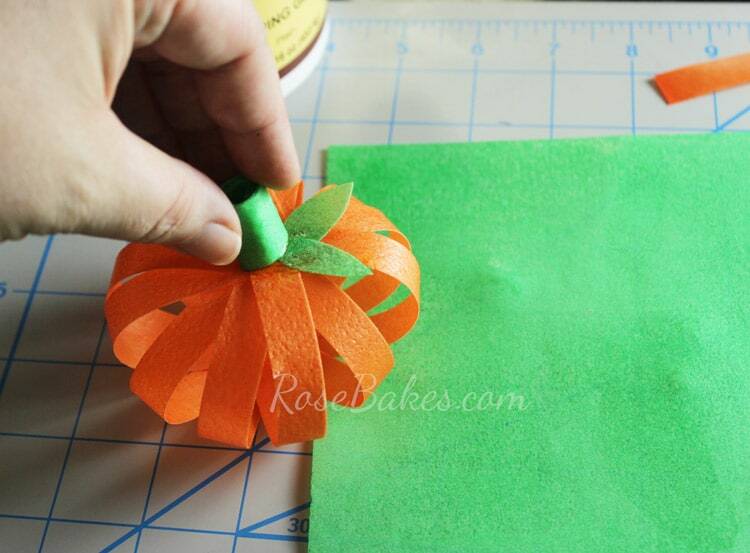 Rose, I LOVE your wafer paper pumpkins!! 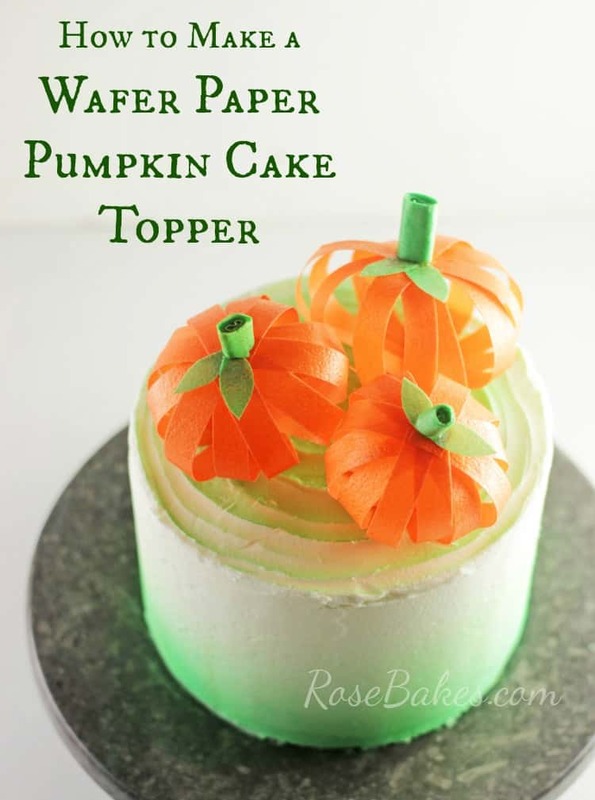 I love the look of wafer paper and your pumpkins are absolutely darling, perfect for the top of the cake! How cute is this cake? I have not heard of wafer paper! Thanks for the tips. Thanks for linking up to Merry Monday! Pinned! Have a great week!